The Bear Creek Trail is a very spectacular trail just off Highway 550, south of Ouray, Colorado. The Bear Creek Trail now stands as a monument to the determination and perseverance of Colorado's nineteenth century miners. It was originally built in the mid 1870s, and rerouted to its present location 20 years later. The old trail follows an unlikely route up Bear Creek, through a canyon that is so rugged it is often impossible to reach the water without ropes. Miners were forced to dynamite horizontal shelves into the rock in order to traverse the vertical walls. The trail passes by the remains of two hundred year old mining camps along the creek. The first couple miles climb steeply from the road, and then the trail is essentially blasted directly into the cliffs. I have no idea how they were able to pull this off over a century ago. After passing a few old mining camps (again, the amount of stuff they lugged up there is incredible) you follow the creek more closely. I love the color of the water in the San Juans (chalky blue, due to the abundance of minerals in the ground). Once above treeline, you hike the last few miles across an open tundra in the upper basin, eventually landing you at Engineer Pass. Once you're within a half mile of the pass, you start to hear cars again. Since Engineer Pass is one of the main passes on the Alpine Loop, its very popular for people with tricked-out jeeps. I stopped for a bit at the top to talk with some of the jeepers... both crews were from Upstate/Western NY (Rochester and Syracuse!). 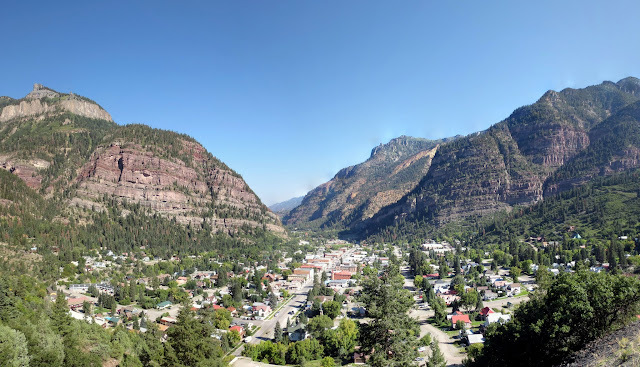 To start, here's a shot of Ouray in the morning. Easy to see why this town rocks. I would NOT trust that road. Man, they would mine anywhere and everywhere.